The following is an expert from the Weekend Report. 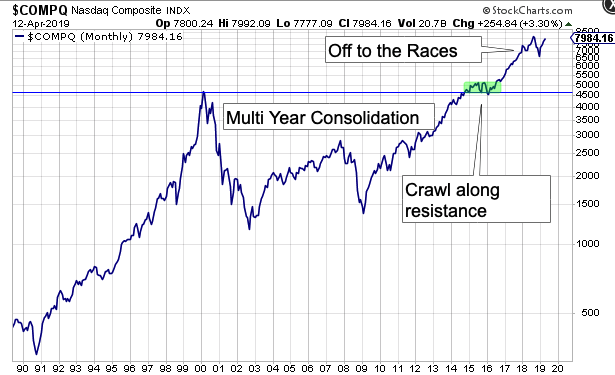 The Nasdaq went through a multi year consolidation from 2000 to 2014. A similar set up is happening with the semiconductors. 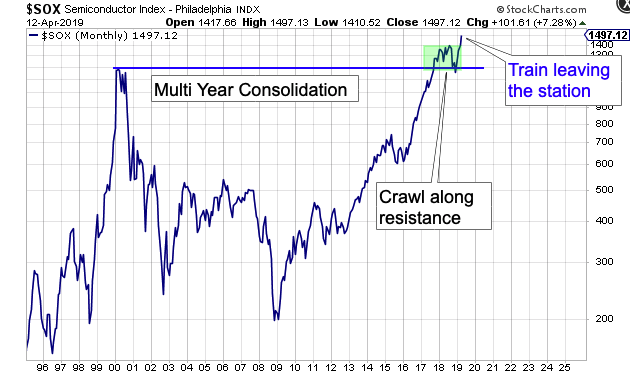 The semi’s went through a multi year consolidation from 1999 to 2017. They then crawled along resistance and now looks to be breaking free. The perfect entry would have been on 12/24/18. If you do not have a position, there will not be another perfect entry. Jumping in now does risk a drawdown. Not jumping in now risks the train leaving without you. And it does look like the train is leaving the station. This entry was posted in Uncategorized and tagged drawdown, NASDAQ, semiconductors by likesmoneystudies. Bookmark the permalink. This train will go nowhere until we see 4 year cycle low. The correction is not over. I do not know how you define a 4 year cycle low. But the criteria that I use to mark the 4 year low, which I discuss in the Weekend Report, indicate the 4 year low is in. A close above the upper monthly cycle band is the last thing I am lookin for confirmation. Simple 4 year cycle lasts 4 years:) Hurst cycle nominal model 54 months for the US indexes running shorter 3,5-4,5 years…. 2 years and 10 months is not 4 year cycle low. Your “criteria” MA10,TSI etc. are great as long as the market is not in sideway corrective pattern – this is what is going corrective sideway wave 4 on big scale with one more leg lower to finish the correction and 4 year cycle low from Feb.2016.